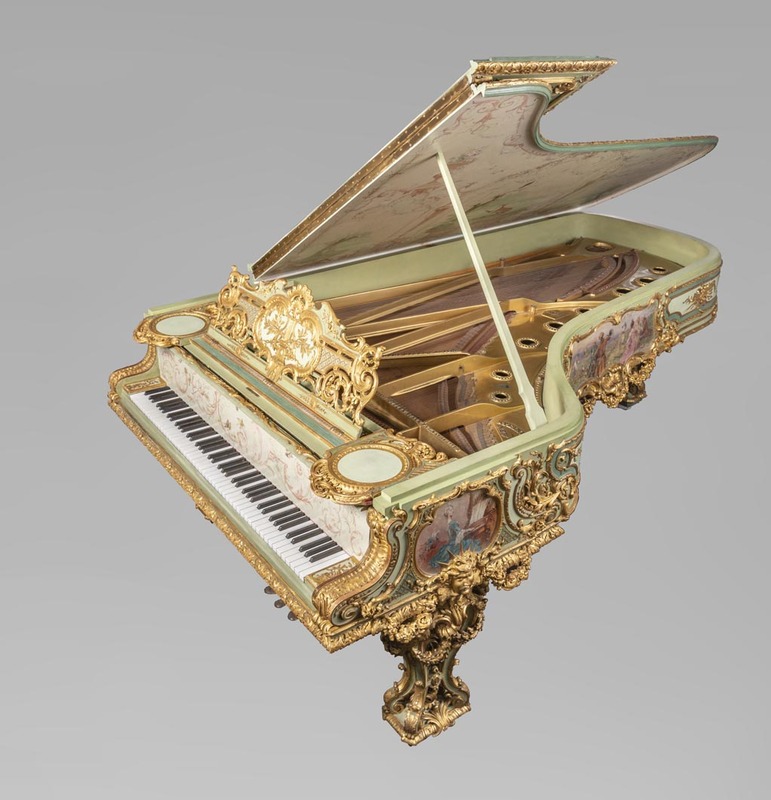 This concert grand piano is absolutely unique and remarkable for many reasons. 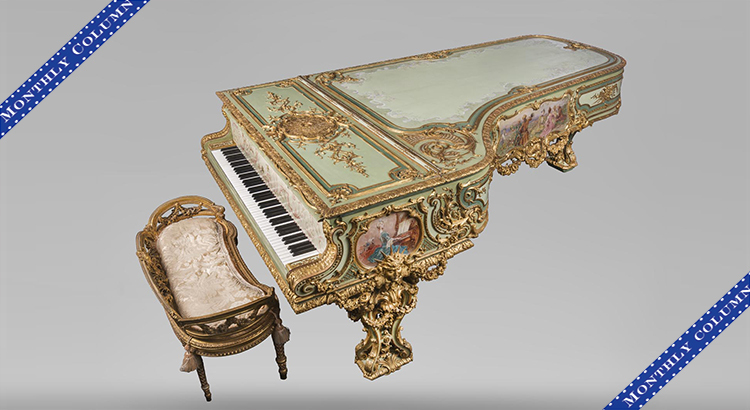 First, it was produced by the prestigious firm Steinway & Sons and registered, in their archive, as ‘a New York Grand Model D, Fancy, White and Gilt, decorated in France, Louis XV style, length 8'10", completion date 22 April 1893, shipped by Cuel Brothers to Paris, sale entered on 21 April 1894’. 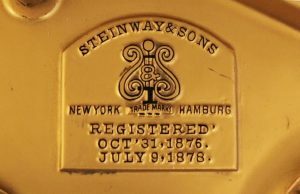 The movement, by Steinway & Sons, is numbered 78400 and the decoration was made by Cuel & Cie. This instrument, with its highest quality, has elsewhere a somptuous decoration. Made out of polychrome wood and giltwood, it has a rich baroque style decoration characterised by curvy lines, beautiful acanthus leaves shaping scrolls, garlands of flowers, vegetal and ova friezes, trellis-work and volutes. Its decoration underlines and accentuates its forms. The ornamental vocabulary is very developed and abundant. The ornamentation covers the piano and hangs from its case. The composition of each leg is very elaborate : they divide into several feet linked together with struts, ending with scrolls and resting on pedestals. They are richly sculpted with flower garlands, winged angels' busts and inverted shells which are quite typical of the Louis XV style. A big crowned mask representing Apollo - god of the Sun, music and the Arts - links the lateral legs to the body of the instrument. It is interesting to note the similarities between this mask and the head of the Statue of Liberty, which also wears a radiant crown. One may note the influence of a joint iconography which was very popular in the artistic field of the time : the mythological figures and especially Apollo. The inside of the lid has a painted decor representing one of the Fables of La Fontaine : Le Corbeau et le Renard ("The Crow and the Fox") while the sides of the piano are decorated with beautiful genre scenes inserted into cartouches and depicting a young woman playing the piano, a lunch in the open air, a pastoral scene and a harp concert in a salon. They were painted by Th. Kammerer for Cuel & Cie, Paris. 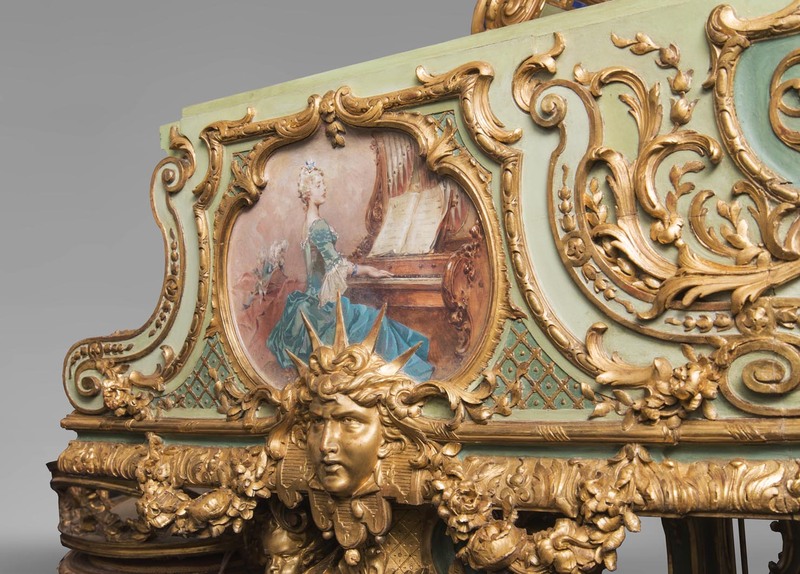 However, the decoration is not the only element that makes this piano such a unique piece : its prestigious provenance also contributes to its uniqueness. 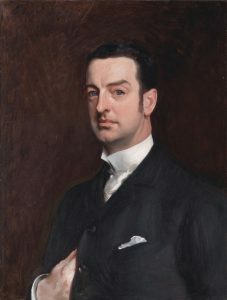 Portrait of Cornelius Vanderbilt I (daguerréotype). 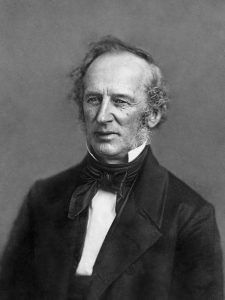 It belonged indeed to Cornelius Vanderbilt II (1843 – 1899), the grandson of the famous captain of industry Cornelius Vanderbilt I (1794 – 1877) who spent some time working in the marine transport and then invested in the rapidly growing railroad industry. Born poor and having only a mediocre education, the "Commodore" was very persevering, clever and opportunistic. He became one of the richest Americans of the history. Despised by the New York high society because he was considered to be a "new rich", he refused to invest himself in philanthropic activities and made only one donation : the first investment which allowed the foundation of the Vanderbilt University of Nashville, Tennessee. He is also famous because he created the Grand Central Depot on 42nd Street in Manhattan. A perfect example of the American Dream, Cornelius Vanderbilt I, a real self-made man, left a $100 million fortune to his children. 1890, oil on canvas, 76,2 x 58,4 cm, private coll. His grandson, Cornelius Vanderbilt II, was the owner of our extraordinary concert grand piano. He received $70 millions from his father and $5 millions from his grand-father (because he was his favorite grandson). He worked for the National Shoe and Leather Bank of New York. At the age of 42, he succeeded them as head of the New York Central and related railroad lines. He because de Vanderbilts' household head. He was involved in many organisations including the YMCA, Red Cross, Salvation Army, Trinity Church, St. Bartholomew's Church, Sunday Breakfast Association, and the Newport Country Club. He married Alice Claypoole Gwynne, they had seven children among whom two died at a very young age from an childhood illness for the first one and from the typhoid fever while attending Yale University for the second one. A stroke in 1896 compelled Cornelius Vanderbilt II to reduce his active business involvement. He died of a cerebral hemorrhage on September 12, 1899 at his home. His mansion, built in 1883 at 1 West 57th Street in New York City and demolished after its sale in 1926, is famous because it was the largest private residence ever built in New York City. With its extraordinary architecture and its somptuous interiors, the Vanderbilt Mansion was a perfect example of the Gilded Age. The end of the 19th century was indeed marked by the emergence of great industrial fortunes built by the captains of industry. They nonetheless spearheaded numerous philanthropic activities and had some remarkable art collections. The Vanderbilt Mansion, a veritable French Neo-Renaissance style castle, was the result of unrivalled artistic collaborations : the architects George Browne Post, Richard Morris Hunt and the famous bronzemaker and interior designer Jules Allard played a part in its elaboration. 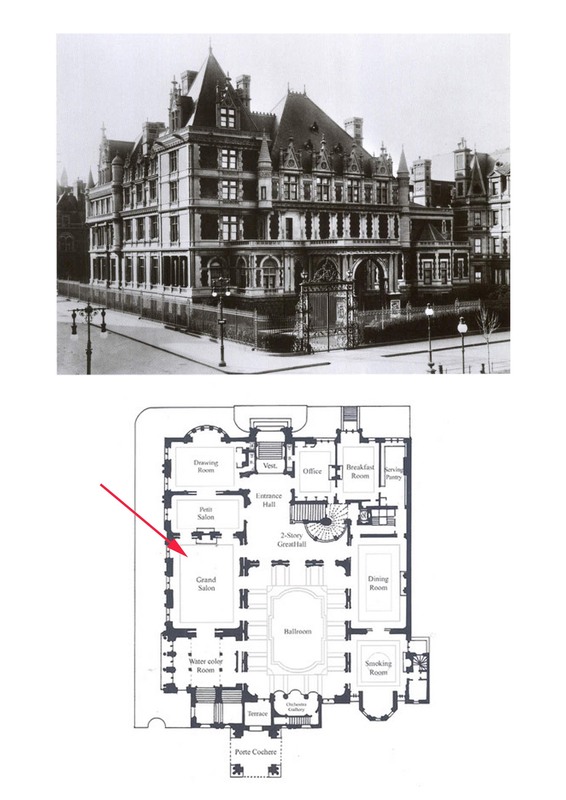 It was built over the vestiges of three brownstone buildings at the West corner of the 57th Street acquired by Cornelius Vanderbilt I in 1877. The first phase of the home was completed in 1882, though by the early 1890s Vanderbilt launched an ambitious renovation which encompassed a massive addition to increase the size of the residence to over 130 rooms. 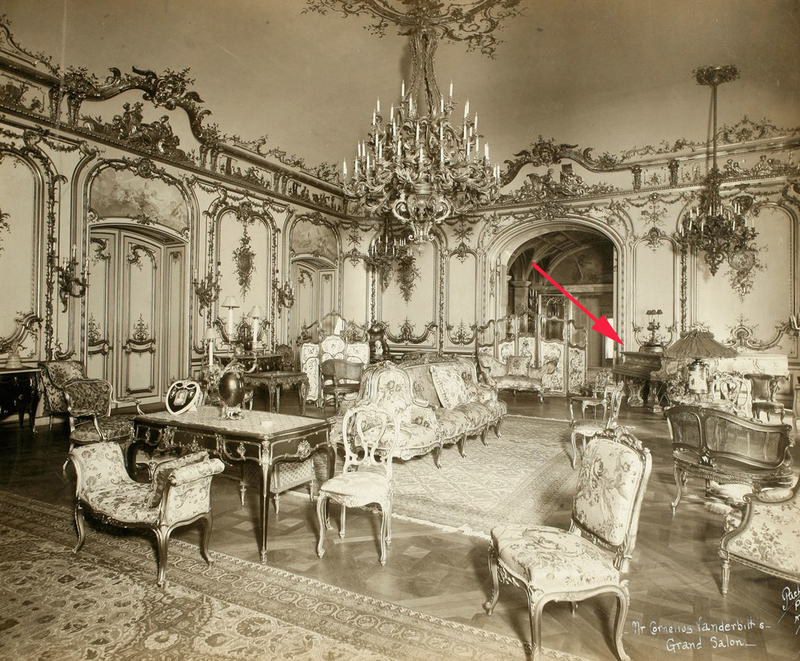 The renovations to the interior equaled that of the exterior and Vanderbilt commissioned designs from the leading American and Parisian firms of the era. Louis Comfort Tiffany designed for him a Moorish-inspired smoking room, Jules Allard was entrusted for the Petit Salon decoration and his Parisian compatriot Gilbert Cuel designed the splendid Grand Salon where the instrument was displayed and admired by the New York's elite. Northwest corner of Fifth Avenue and 57th Street in New York City. A photograph of the Grand Salon where the concert grand piano was displayed. 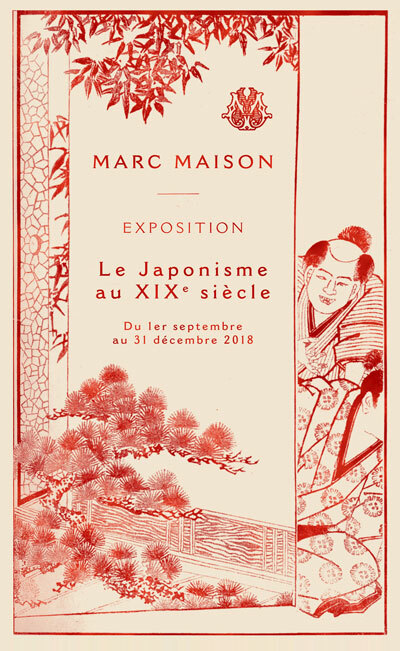 This spectacular instrument astonishingly survived the 1927 demolition of the mansion and eventual sale of the opulent contents through generations of the family. The summer residence that Cornelius Vanderbilt I built in Newport has not been demolished and still shows his lifestyle and his artistic tastes. 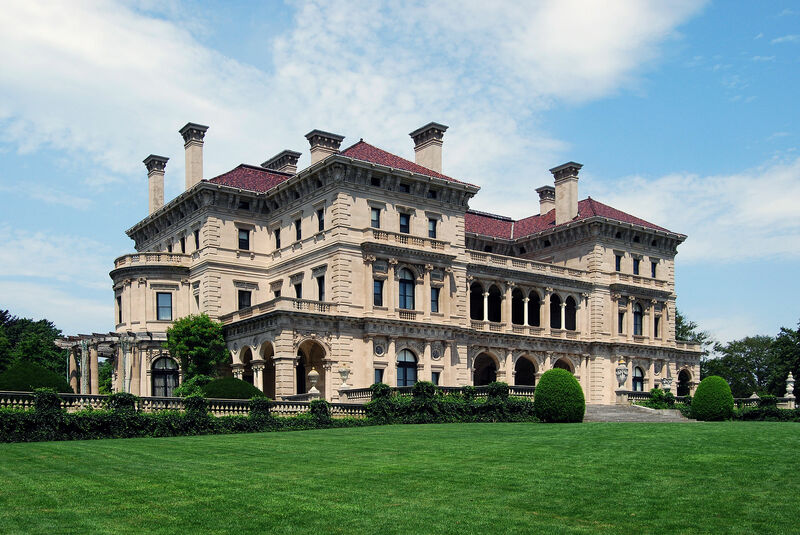 The Breakers, Vanderbilt's Residence, Ochre Point Avenue, Newport, Rhode Island, United States.